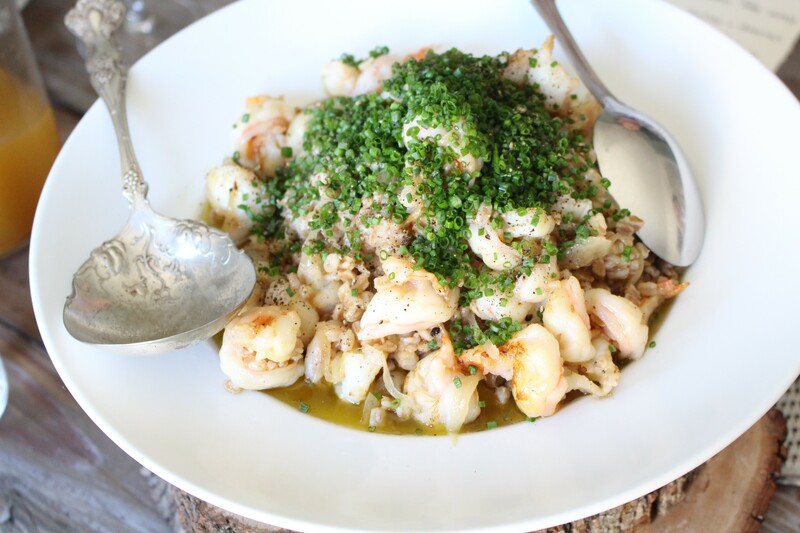 Shrimp and farro cooked in sparkling wine at a recent Monifa Dayo brunch. first cookbook, Commis Chef. This week, she began raising funds to send her to France, The Gambia, and Senegal for about five months of research. The book will tell the stories of commis chefs, the cooks at the bottom of the kitchen hierarchy, starting with Dayo’s own experiences in Bay Area restaurants. It’ll follow her to West Africa and France, where she’ll work in small, mom-and-pop restaurants, picking up inspiration, chatting with fellow prep cooks, and connecting influences between cuisines. She’ll write about white supremacy, the patriarchy, and colonialism, and how they all tie into food. To celebrate the launch of Commis Chef, she’ll host a party at Cosecha (907 Washington St., Oakland) on Sunday, Mar. 25. In a sense, it’s Dayo’s first major greeting to the wider public — and at $25, it’s a lower-commitment option for folks to snag a taste of her cooking compared to one of her leisurely supper club meals. Keep up to date on the party, other events, and the cookbook by signing up for the mailing list on her website, MonifaDayo.com, or following her on Instagram (@MonifaDayo). To attend one of her meals is to gain understanding into Dayo’s struggle as a Black woman in today’s high-end restaurants — and that’s the truth she wants to capture in Commis Chef.